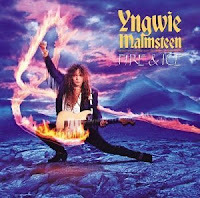 Aside from technical prowess, distinctions of Malmsteen's guitar style include a wide, violin-like vibrato inspired by classical violinists, and use of such minor scales as the Harmonic minor, and minor modes such as Phrygian, and Aeolian. Malmsteen cites the Fender Stratocaster and the single coil pickups as being instrumental to his unique tone. He uses his custom design by DiMarzio, a vertically-stacked humbucker mounted in a single coil housing. Malmsteen sought to combine the tone of a single coil with the reduced noise of a humbucker. The Malmsteen signature model Stratocaster made by Fender is based on this combination. Malmsteen prefers vintage Fender Stratocasters from 1968 through 1972. On all his guitars, the tone control is disconnected, and so is the middle pickup. Malmsteen only uses the bridge (DiMarzio HS-3) and neck pickups (DiMarzio YJM) on his guitars and allows the low output DiMarzio HS-3 on the bridge pickup to be driven by the floor pedals for his unique rich sound. All of Malmsteen's Stratocasters have brass nuts and are refretted with Dunlop 6000 super jumbo fretwire. According to Fender, Malmsteen has one of the most impressive collection of vintage Fender Stratocasters known. He has well over 200 Stratocasters, including one original Fender Stratocaster actually signed by Leo Fender. The guitars he uses are recognisable by the addition of custom scalloped fretboards. This is similar to a regular fretboard, but with wood 'scalloped' or scooped away to form a concave shape in between the frets. Malmsteen allegedly conceived this design as a teenager while working in a music store in Stockholm, Sweden when he came across a 17th century lute with a scalloped neck using the raised wood as frets. However, this can also be viewed as an influence from Ritchie Blackmore, one of his most readily admitted idols, who also favours scalloped neck Fender Stratocasters. Malmsteen himself has said he learned most from Ritchie Blackmore's guitar riffs and solos soon after he started learning the guitar. Also, jazz-fusion guitarist John McLaughlin used scalloped fingerboards long before Malmsteen gained fame. Even for the experienced guitar player, the scalloped fingerboard proves very difficult to perform on, as there is no surface contact between finger and wood to aid in the feel of the vibrato motion. The strings of the guitar, when fretted, are easily pushed sharp and out of tune. The highly accurate, yet delicate, controlled touch required to play properly with Malmsteen's modified Stratocaster is elusive for most, and an integral part of Malmsteen's technique. Malmsteen briefly used Schecter Guitars in the 1980s, who built him strat-style guitars similar to his Fenders. Throughout the years, Malmsteen has stayed true to the basic equipment he uses on stage. Malmsteen continues to use strictly vintage 1971 Marshall amplifiers for his live performances. Often wowing his audiences with his vintage Marshall collection, Malmsteen regularly performs with a literal wall of up to 27 vintage Marshall 4x12 Cabinets with G30 Celestion speakers (30 Watt). All of the 24 heads on the cabinets are Vintage 1971 Mark II Marshall 50 Watt heads. All wireless units are Samson. Floor pedals consist of a Boss CS-3 Compression Sustainer, Roland DC-10 analog echo pedal, vintage Dunlop Cry-Baby Wah Pedal, Roland PK-5 MIDI pedal, Boss OC-2 Octave, DOD 250 Overdrive Pre-Amp pedal, Boss NS-2 Noise Suppressor and a floor switch box for his effects rack by Bob Bradshaw. Malmsteen's guitars onstage are strictly 1968-1972 Fender Stratocasters. Malmsteen has claimed in an instructional video when asked why he chooses the Stratocasters from the late 1960s & early 1970s that the "bullet" truss rod in the neck and the large headstock design added a richer, fuller tone to the guitar that set it apart from Stratocasters from other eras. Fender discontinued the large headstock in the late 1970s and has since produced a re-issue of the "70s Series" Stratocaster. For his acoustic sets, Malmsteen uses a nylon stringed electro-acoustic black or white Ovation Viper. These guitars are equipped with Piezo pickups run into the Boss CS-3 pedal direct into the mixing desk, out to the PA and stage monitors. Prior to the Ovations, Malmsteen used Aria, Alvarez & Gibson classical acoustics on stage. All live microphones are Shure SM57's. Over the years, Malmsteen has used various brands of strings from Ernie Ball, Fender and now recently, he has his own signature string sets available from Dean Markley entitled "Electric Magic." The string weights vary, but Malmsteen regularly performs onstage with a custom light top,heavy bottom string gauge ranging from 0.08 through 0.48 gauge which are considered by most guitarists to be very thin especially with the downtuning. Malmsteen's picks are Jim Dunlop 1.5 mm white with his signature on them. Malmsteen regularly goes through many picks during a live show which he flicks out into the audience throughout the entire set.